Spray a 10”x10” baking dish with non-stick cooking spray. Set aside. In a large bowl, combine Cheerios™, honey and peanut butter. Fold with wet hands until all ingredients are combined. Transfer mixture to the baking dish and press down with wet hands. Sprinkle evenly with sunflower seeds and let set for at least 1 hour. Slice in squares or roll into balls, and enjoy. Add chocolate chips and package the bars individually to make a great hostess gift. My kitchen table is always displaying treats available for the taking. My family loves to see what I've created during the day, and they enjoy whatever it is I've made for them. 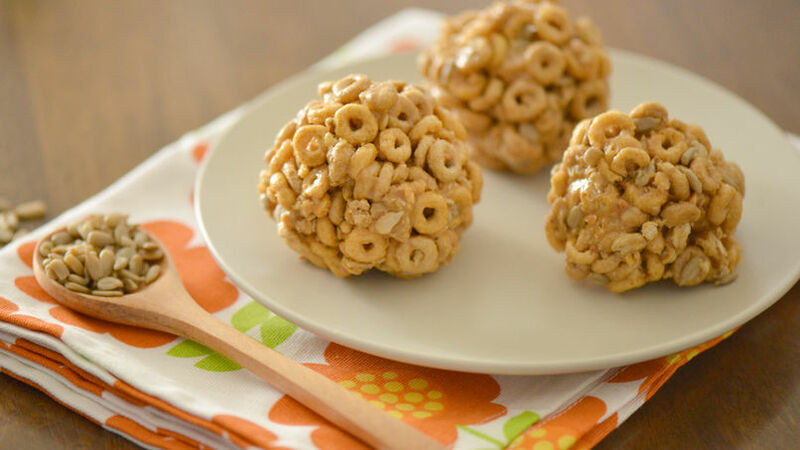 These Cheerios™ protein snacks were no exception. In fact, they disappeared in minutes. I made them again and packed them up for a tasty school and office treat. These cereal bars are no-bake, call for very few ingredients and are ready in just a few minutes; the perfect snack for any family that's on the go.